Who loves to bake this time of year? Me too! 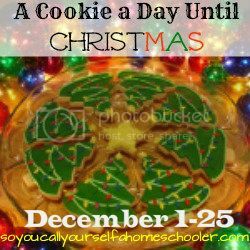 Carlie has put together a great little event called A Cookie a Day Until Christmas, and she'll be featuring a new cookie recipe each day from bloggers all over the web. If you're looking for something new to add to your cookie repertoire, you'll have a whole 25 days-worth of recipes to choose from! Just click the link and you're good to go.